The combination of innovative and traditional process technologies has resulted in major advancements in the antibody industry, such as accelerated process development and time-to-market. In addition, this paper examines the avenues that have opened as a result of exploring established process technologies for new applications, as in the case of perfusion cell cultures to amplify dhfr-based expression cell lines by incrementally increasing selection markers in the perfusion medium for the faster generation of stable and high-productivity clones. Furthermore, performing perfusion processes in single-use bioreactors has provided a convenient means of generating large amounts of cells for high density freezing in cGMP cell banking operations. High cell density freezing minimizes the inoculum expansion time from vial thaw to seed bioreactor and leads to cost-effective facility utilization. All phases of cell line development have been integrated using a single medium — from host cell bank adaptation to high level antibody production — which has provided more predictable feed streams for non-affinity purification processes. Cation exchange separation was converted from a polishing application to a purification workhorse of three to two column non-Protein A purification processes. Overall improvements in human monoclonal antibody (HuMab) production, using Chinese Hamster Ovary (CHO) cells, has not only targeted both process and product consistency throughout development, but also addressed process flexibility and operational ease with interspersed disposable options. Antibody manufacturing processes have been continuously elevated to the ‘next level’ by incorporating technology advancements at various process stages (1). Addressing the economics of production has not been balanced throughout the various processing steps, and as a consequence generated obvious limitations in certain areas of production. An integrated approach with higher cell culture productivity and high capacity purification processes has certainly provided some improvements compared with traditional process schemes (2). Process flexibility is another area of demand that was challenged by increasing expression levels to fit the processes into multiple manufacturing facilities. The introduction of single-use technologies is paving the way to built in-flexibility, as well as enabling faster processing times for large volume batches. In this context, the advantages of the extended applications of single-use perfusion bioreactor processes in cell line development and cell banking procedures — along with disposable chromatography matrices in downstream processing for enhanced facility throughput — are discussed. The cost structure of manufactured lots depends on process time and productivity. A closer look at different process phases is essential to accelerate development and enhance process capability. Two recent examples are emerging process technologies that enable both cell and antibody concentrations in low volume cell culture media that offer an attractive package, not only for high titre expression levels (above 25 g/L [3,], but also for integrating recovery operations with extreme cell densities. Furthermore, the assembly of individual process units is easy and flexible because of the application of single-use systems and can lead to significant cost reductions for upstream and recovery unit operations. An additional example is a process with compact packed bed bioreactors with CHO cell densities of ~250×106/mL and as high as 70 g/L of bed volume productivity during perfusion (4). Thus, process technologists are continuously evaluating tools that can minimize equipment sizes and processing volumes, and simultaneously increase titres. However, until we develop a multipronged approach to high capacity purification schemes with high throughput processing steps, this only partially eases the burden on downstream processing (5). Here we take a closer look at a unified approach — from early cell line development to purification — examining process and product consistency, as well as streamlining both upstream and downstream processes, for economics and flexibility for tech transfer to multiple facility designs. Production cell line development that depends on amplification for high expression, such as a dhfr-based system, is a prolonged and labour-intensive process. The amplification of cell lines is generally done by conventional methods that hold the cultures in shake flasks or other small batch containers in the presence of gradually increasing MTX concentrations, or other selection markers, to increase the gene copy number (6). 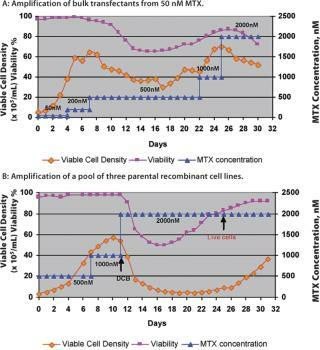 A fully amplified production cell line — from 50 nM up to 2 µM MTX — takes approximately 7–8 months. However, a novel and continuous method of amplification, using a perfusion process to isolate stably amplified cell lines, has been developed. This process can be started at a very early stage with a transfection pool at the 50 nM MTX level. 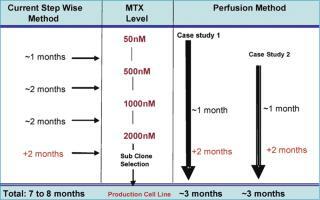 Either cells from a transfection pool, parental cell lines or a cell line resistant to a certain level of MTX can be applied to the perfusion process and a gradual increase in MTX level is applied through the perfusion medium (Figure 1). Growth and cell viability are monitored at regular intervals. The increase in MTX level is based on growth inhibition and gradual viability decline, which is eventually relieved by amplification-induced adaptation of the cells. Amplification is done in the same perfusion bioreactor, from 50 nM to 2 µM or above, and the cell samples are subcloned further to isolate high producing clones. The entire amplification process can be completed in a shorter period of time instead of several months (Figure 2). Cell lines generated like this show an increased copy number for the dhfr gene (Table 1), indicating amplification of the gene of interest as well as increased MTX resistance. Cells from perfusion bioreactors are suitable for subcloning using Animal Component Free (ACF) medium, and the associated production cell lines reach high titres (>2 g/L) in batch-fed processes. The growth and productivity of these amplified cell lines is comparable with that obtained by traditional (lengthy) amplification procedures. This method of amplification can be extended to any expression system and/or recombinant cell line that is suitable for amplification and can result in accelerated cell line development — with up to 60% less time required to produce an amplified cell line with a significant increase in specific productivity (Table 1). Disposable perfusion units are readily available for this purpose and perfusion volumes can be kept to a minimum, as only a small sample is needed for further subcloning purposes. Inoculum expansion takes a considerable amount of time for mammalian cell lines because of their relatively long generation time in culture medium. Although population doubling time is one of the criteria for production cell line selection, to get enough cells to inoculate a large-scale production bioreactor generally takes from a few weeks up to a month. To minimize this lengthy process, different strategies are employed, such as starting with multiple vials or a large volume of cells from cryopreserved bag banks, or staging multiple inoculum lots (7). HuMab CHO cell banks are stored in ACF medium at 2–3 × 107 cells/mL for several years, and a single vial thaw can take 10 days or more in shake flasks and spinners to reach the 50 L seed bioreactor level. Attempts were made to increase the cell density/vial by a factor of 10 by increasing the vial volume, which required ~6.0 × 1010 cells to make cell banks of 200 vials. However, because many cGMP-banking facilities have space constraints and are unable to produce large numbers of cells in conventional spinner cultures, an alternative means of obtaining actively growing cells that are suitable for banking at high density was identified. Because validating single-use bioreactors is relatively straightforward, a disposable perfusion bioreactor unit, which has a smaller footprint, was favoured. 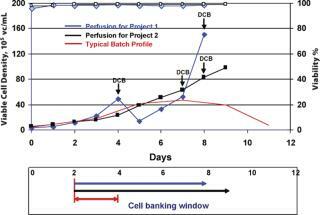 This perfusion process provided a wider window of banking time when the cells were in a highly viable stage at high densities and have proven to be long lasting when frozen at different points of growth curve (Figure 3). Cell banks with 9 mL/vial at 3 × 107 cells/mL in ACF medium were maintained for several months in cryofreezers and are comparable with the banks frozen from log-phase cultures from large spinners as asessed by recovery and growth profiles (Table 2). Using a single vial from this bank can not only reduce inoculum expansion time but can also be used to directly inoculate small-scale disposable bioreactors. A universal medium that can support transfection, selection and amplification, as well as cell culture optimization for high productivity, has both time and cost advantages — in addition to offering consistent product characteristics. Such a medium not only reduces overall cell culture development timelines, but also provides a uniform process development platform by minimizing the changes caused by intermittent adaptation processes. 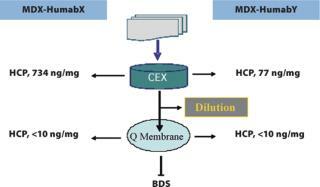 A concerted effort towards the development of a proprietary Medarex medium, MTCM A, as part of an integrated cell line and cell culture process development was done for a HuMab CHO production platform. Adjusting the nutrient requirement levels for the cell lines further optimized this medium and an improved second-generation medium, MTCM B, was derived. These two media, with minor compositional changes, can support transfection, amplification, subcloning and production, and were successfully used to develop different-but-related CHO cell lines for HuMab production. Used with perfusion amplification, as described earlier, MTCM medium facilitates the generation of multiple cell lines that are already adapted to bioreactor conditions. 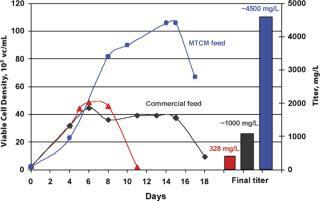 Feed formulations and feed strategies have been developed according to one or two generic processes, using MTCM A or B basal media to reach high expression levels. In most cases, when high productivities are required in short timelines, these processes only need minimal optimization. These fed-batch processes with multiple feeds yield 1–6 g/L of HuMab with MTCM basal and feed media combinations for recombinant cell lines derived from different expression systems, which can increase productivity 11-fold compared with batch cultures (Figure 4). High yield processes can also be developed using commercially available, chemically defined basal media along with MTCM feed media (Figure 5). Up to 13-fold increases in productivity were observed when using commercial basal medium, MTCM feed and our generic feed strategies — surpassing the generally reported 2–5 fold productivity gains obtained by media and process optimization efforts (8). These media compositions were also blended into powder formulations in hundreds of kilogram quantities and tested at the process development stage. Powdered media are proving to be more suitable for large-scale manufacturing and remain stable for prolonged periods without compromising product titre and quality. The downstream capacity crunch has attracted lot of attention regarding limitations and productivity enhancements. Capture chromatography is a critical and expensive rate-limiting step in the purification process that requires multiple cycles and can also affect the stability of the molecule (if not processed in time, complex contaminants can influence molecular integrity). As an alternative high throughput strategy, different approaches are being developed that include a non-Protein A purification platform that enables higher binding capacities and a low number of capture cycles (Table 3). Well-developed processes comprise different schemes that use two- or one-column steps that can lower the cost of goods by 50–70%, to that of the three-column non-Protein A processes that were originally developed. However, non-Protein A processes based on PEG precipitation or salt/primary recovery filtration as the first step lose some degree of viral clearance capability because of the absence of Protein A chromatography. In general, cation exchange is not considered to be a significant adventitious agent removal step; in some low pH processing conditions, however, CEX has been shown to improve viral clearance (9). However, the influence of these conditions on impurity profiles, when CEX is a workhorse of purification as a capture column, needs further evaluation. Designing effective viral clearance strategies for non-affinity schemes will be essential for lean and efficient processes. Analysing viral clearance data from multiple HuMab purification schemes for each of the chromatography operations was useful in establishing the building blocks for two-step processes. The potential application of this information for a modular approach to viral clearance strategies for early clinical phase material — where Protein A is not the part of purification process — should be further explored. Anion exchange membrane chromatography has been an integral part of the development and scale-up of non-affinity HuMab purification processes, not only for polishing but also for robust viral clearance (5). Streamlining the process economics of Q Membrane units depends on integrated process step modifications and the optimization of process conditions, which can result in loadings as high as 20 g of antibody/mL of membrane with more than 4 logs reduction of aMuLV or MVM (Table 4). One of the current upgrades concerning viral removal filtration is stepping up the protein concentration in the feed from 10 mg/mL to 30 mg/mL without affecting the process volume and viral log reduction. Such improvements are timely and more suited to processing proteins from high binding resins without large dilutions. Currently, an extensive effort is being made to replace affinity resin by antibody precipitation or, in some cases, contaminant precipitation to derive better feed streams to limit the number of processing steps (10,11,12). The use of antibody precipitation by PEG has been reported for high titre processes that are further purified using two ion exchange chromatography steps (13). Approximately 3–10 fold reductions in bioreactor harvest volumes — with relatively high protein concentrations — can be obtained by precipitation and can be directly loaded onto ion exchange capture columns with binding capacities of up to 100 mg/mL resin. Contaminant profiles after capture for some antibody preparations can be lowered below two logs for CHO expression by applying differential binding and elution optimization for cation exchange resins. In this context, replacing resin capture chromatography with membrane-based high throughput disposable or multicycle cation exchange formats can further simplify downstream processing (14). Economic evaluation, as with other membrane scale-up modules, and scalability of the process for contaminant clearance, needs to be thoroughly analyzed as it not only depends on the binding capacity, but also on ‘bind and elute’ resolution sensitivities. Residual impurities can be effectively removed by anion exchange membrane chromatography, and can be integrated with other steps of viral filtration to meet the critical quality attributes of the product (15). The enhanced capacities of disposable membrane separation techniques are economical and positively influence validation and manufacturing costs. Low buffer volume requirements for combined CEX and AEX membrane chromatography separations can alleviate tank storage limitations, which is a primary concern when processing large volume, high titre products (Figure 6). These processes are still manageable in facilities built in the past for relatively low titre processes (Table 5). The overlapping analysis of process and facility design, engineering and equipment availability provides insights into the design of models to identify and resolve some of the facility related constraints associated with high yield antibody processes. Such evaluations have resulted in effective capacity utilization and significantly improved processing parameters for various candidate molecules. The use of the same in-house culture medium from cell line development to production has minimized the potential for media shifts and led to leaner inventory requirements in manufacturing. Testing and using powder formulations for both basal and feed media has contributed to convenient transport and storage for multiple HuMab projects. High capacity ion exchange processes have proven to be better fits than affinity based processes for handling increasing antibody levels. Manufacturing efficiency and operational success have improved several fold by employing single-use and easy-to-operate process steps with higher productivity. Although high-titre processes pose obvious challenges during certain processing stages, if handled by using an integrated approach, in a timely manner, industry can reap the potential benefits of bringing biomolecules to market faster and relatively cheaper. Certainly, as we are already witnessing, our future efforts towards technology evolution are focused in this direction, leading to bioprocess simplicity. In addition, effective regulatory strategies allowing smooth transitions to scale-up can drive down the costs associated with constantly improving cell lines, cell banks, upstream and downstream processes and updating the regulatory submissions for early to late stage clinical trials. 1.) Zhou, JX. 2007.Optimization of Antibody Processing: Upstream and DownstreamAdvances in Large-Scale Biopharmaceutical Manufacturing and Scale-Up Production2nd Edition, ASM Press and BioPlan Associates, Inc., Rockville:779-816. 2.) Arunakumari, A, and J. Wang Gottschalk, U.. 2008.Purification of Human Monoclonal Antibodies: Non-Protein A StrategiesBook Chapter for Process Scale Purification of Antibodies, To be published by John Wiley & Sons, Inc.. 3.) Percivia, X. 2008.Press Release: DSM and Crucell Announce Record Achievement in PER.C6 Technology, Heerlen/Leiden, the Netherlands. 4.) Selexis, SA, and SA. Artelis. 2008. Artelis and Selexis Report Record Antibody Production Levels in CHO Cells of Over 31 Grams per Liter. 5.) Arunakumari, A, J Wang, and G. Ferreira. 2007.Improved Downstream Process Design for Human Monoclonal Antibody ProductionAdvances in Process Chromatography (Supplement to BioPharm International):36-40. 6.) Wurm, FM. 2004. Production of Recombinant Protein Therapeutics in Cultivated Mammalian Cells. Nature Biotechnology 22:1393-1398. 7.) Heidemann, R. 2002. A New Seed-Train Expansion Method for Recombinant Mammalian Cell Lines. Cytotechnology 38:99-108. 8.) DePalma, A. 2008. Changing Needs Drive the Media Market. Customized Cell Culture Media Predicted to Increase Productivity While Decreasing Costs. Genetic Engineering & Biotechnology News (www.genengnews.com/articles/chitem.aspx?aid=2346&chid=3) 28. 9.) Moscariello, J. 2008.Comparison of Potential Monoclonal Antibody Purification Processes with Two Chromatography Steps, Presentation at BioProcess International Conference & Exhibition, Anaheim. 10.) Vilmorin, P. 2008.Scale-up Evaluation of Selective Antibody Precipitation and Continuous Recovery with a Disc-Stack Centrifuge, Presentation at BioProcess International Conference & Exhibition, Anaheim. 11.) Glynn, JK. 2008.Development of a Precipitation Alternative and Improvements for Protein A for Impurity Reduction in Clarified Broth Containing a Monoclonal Antibody, Presentation at BioProcess International Conference, Anaheim. 12.) Glynn, J. 2004. Process-Scale Precipitation of Impurities in Mammalian Cell Culture Broth. Purifying Monoclonal Antibodies:12-18. 13.) Ramanan, S, and R. Stenson Method of Isolating Antibodies by Precipitation. 14.) Shields, C. 2008.Advances in Single-Use Capture Chromatography. Natrix Technology Workshop at Single-Use Applications for Biopharmaceutical Manufacturing Conference, San Diego. 15.) Ray, S, and K. Tarrach. September 2008. Virus Clearance Strategy Using a Three Tier Orthogonal Technology Platform. BioPharm Int (online publication).